Make a statement with this Smart, little diaper bag. Instant access to wipes, diapers, tissues, and baggies. Unfolds into a changing station with quick access to all dispensers. Small enough to fit in your personal tote. 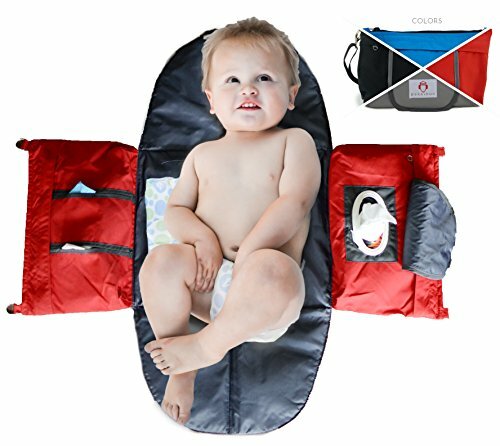 Adjustable, detachable strap allows you to use as an over the shoulder, cross body bag as well as clip on to anything such as your stroller. UNFOLDS INTO CHANGING STATION – with quick access to all dispensers. SMALL CLUTCH SIZE – small enough to fit in your personal tote. ADJUSTABLE DETACHABLE STRAP – allows you to use as an over the shoulder, cross body bag as well as clip on to anything such as your stroller.